robotcowboy is a one-man band musical project using custom hardware and software running on a wearable computer. In its first incarnation, titled cabled madness, it is an attempt to meld rock with realtime algorithmic composition tools into a dynamic live show. A MIDI guitar, crazy control devices, various masks, and synchronized visuals make for a new new wave experience. He was a completely self-contained one-man band, who played and triggered all of his music utilizing methods I had never encountered. … The songs were very structured and melodic, in a complex yet simple listening sense. His name, "robotcowboy", really fit the type of music he was playing. ... I truly felt I was witnessing "The Future". Wow. The sound is meant to be gritty, noisy, and melodic. Unlike the cold precision of most electronic music, care has been taken to incorporate the frailty of the live human performer. Live musicians make mistakes and this fact adds an element of excitement to the music and robotcowboy songs are constructed using parts generated in realtime as the performer plays. Dan Wilcox is a computer engineer by trade and a musician by heart. He has been playing in bands for over 6 years, most notably the Surf-DEVO 7inchWave. Computer software and electronics are becoming his musical tools of choice nowadays. He is influenced by DEVO, The Residents, Sun Ra, Raymond Scott, and others. He enjoys old Sci-Fi including the 1950's radio show, X-1. robotcowboy is his Master's thesis in Art & Technology at Chalmers in Göteborg, Sweden. Coming from his punk and rock roots in America, Dan's Swedish studies opened him towards the avant garde noise and experimental music in Göteborg. This expanding of horizons led him to develop the idea of a dynamic, computer-based one-man band rock show. 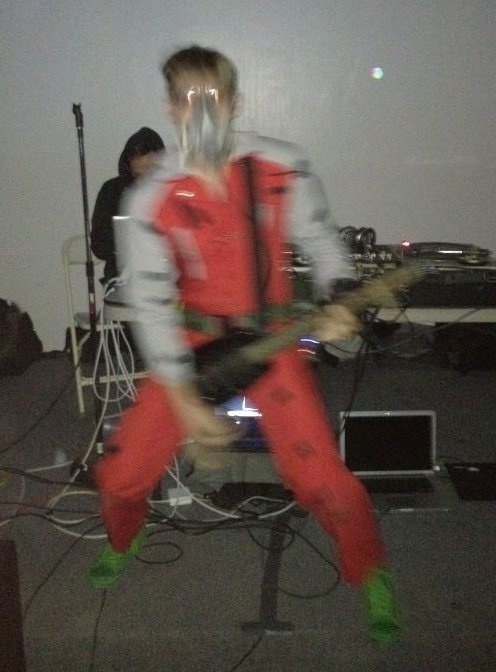 robotcowboy is his stab towards the future as well as a critique of laptop dj/vj sets and live computer sound. In the world of robotcowboy, the man and machine are merged into an imperfect cyborg entity, the sweat and feeling of man and the cold logic of machine. robotcowboy consists of a wearable computer system and custom hardware and software. The machine itself is a commercial industrial wearable computer running the GNU/Linux Ubuntu operating system. All audio processing and generation is performed in Pure Data, a graphical multimedia programming language. Data from my MIDI guitar, gamepad, and wrist keyboard are routed to Pure Data by custom software. The visual program running on the robotcowboy helmet is a simple, custom sprite engine. The robotcowboy helmet and led mask are both handmade.